If you're like me, when you think back to those Easter childhood memories, the eggs are at the forefront! Finding them, opening them... and of course, dying them! Oh what wonderful memories of the vinegar smells and the stained hands that lasted for days on end. I loved it! As a mom, I still love doing it with my kids, but I also want to be smart about it--- limiting the messes to a manageable level, making it easier for little hands, etc. Feel the same? Today I'm sharing a few Easter egg dying tips that might just help make your Easter a little more stress free! Do it outside! 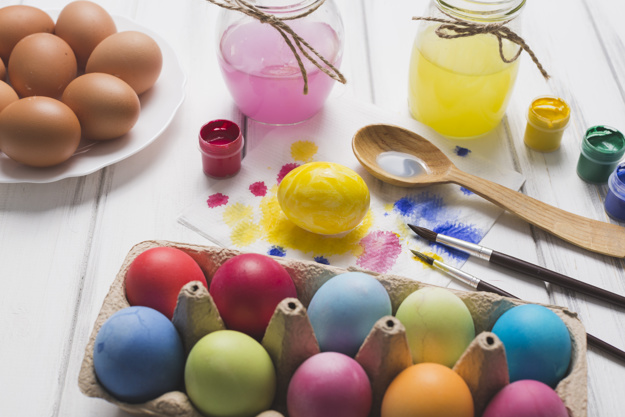 We all know egg dying can be messy, so if at all possible- head outside to do it! You'll have less mess to clean up and you'll get some sunshine too! Use a disposable table cloth. If you can't head outside, prepare your space to avoid stains and make clean up easier with a disposable plastic table cloth. You can usually find these at your local Dollar Tree so it's very inexpensive and a great way to save your table (or floor) from spilled/dripped dyes. Use a muffin tin. Don't want to clean a million dishes? Muffin tins can be a great way to dye your eggs-- one color in each opening! One dish to clean! Add baking soda. Want to make your eggs easier to peel? Adding baking soda to your water when boiling is said to make the peeling easier--- a tip to keep in mind for deviled eggs as well! Use a Whisk. When it comes to actually dying your eggs--- getting the eggs into and out of the water can be quite the challenge. Most dye kits come with a little wire tool that is intended to hold the egg, but I find they don't always work the best... instead, pop those eggs inside a whisk for easy holding and more control. Much better for those littlest of hands too! Skip the box. Create an easy DIY dye with 1 cup water, 1 tsp vinegar and food coloring. Add more coloring to get the bright, bold colors you desire, or less for a more subtle look. By creating your own you can truly customize to get the colors you want. Use Kool-Aid. Mix 1 cup of water with 1 package of Kool-Aid to create a fun DIY dye that smells MUCH better than your typical vinegar mix. White Crayon Designs. Before dying, draw a fun design in white crayon! Once you dye, the design will shine through. Rubber Band Designs. Wrap a rubber band around your egg to create fun designs, after they are dyed, remove and you'll see a fun striped design left behind. Rice Dye. This is a fun method that skips the liquid dyes altogether! Mix dry rice with food coloring. Add your egg and give it a shake! It gives a beautiful color with a fun speckled look. Shaving/Whipped Cream. Mix food coloring with either shaving cream or whipped cream, roll your egg, let sit and wipe off for a fun marbled look. Draw Sharpie Designs. Sharpies are great for everything, right? Decorating Easter eggs is no exception. Skip traditional dyes (or add to them) with beautifully drawn Sharpie designs! Use Temporary Tattoos. Not much of an artist, but want to add some beautiful art to your eggs? Pick up some temporary tattoos and add to your eggs instead. These go on just as they would the skin, press, apply water and remove backing... super easy! Create an Ombre Effect. Start by placing your egg in just a small amount of dye---enough to cover just a portion. Let sit a few minutes, add a bit of water to the mix, repeat until the egg is complete covered. The bottom part of your egg will be darker, and gradually lighten at the top as water is added! I love your tips! I'm using muffin tins for the dyes and whisks to remove the eggs from the dye!